After all the attacks in the Middle East, especially Syria, many natives have chosen to leave their homes and escape to another country. As there are many thousands of people fleeing these countries, the question remains of what to do with them. This is a complicated question, especially after the recent attacks in Paris, which have increased the hostility and wariness towards these refugees. Having so many undocumented people flooding into a country at once poses many threats to security, as well as providing yet another means for ISIS and other terrorists to enter into a country. As a result of this, many countries have sealed their borders, saying they will not welcome any refugees. This includes as many as 31 U.S. states. Although the threats to security are very real, there are two important considerations to take into account. One, the refugees are in danger of being seen merely as a problem, and not as people with dignity. Two, we actually have a moral obligation to help other people in need as our circumstances allow. As it is easy to push aside the responsibility, so it is easy to view the refugees as the problem itself and not as human persons in need. For instance, many politicians of today chose to use the question of the Syrian refugees as means to further their own political agenda. However, we must remember that these refugees are persons with dignity, and no matter what the situation, they must always be looked at and cared for as such. Secondly, why should we have to do anything to help? Can’t Syria help out its own people? The answer is not a simple one. People are fleeing their homelands, giving up everything, in search of safety in a foreign country. While there are many complications and threats to security in helping these people find the shelter they need, most basically, the answer comes down to a moral obligation we have to help others in need. People are social creatures and so gravitate to living in communities naturally. Man lives with others not as strangers, but in a personal community. This communal living also requires the existence of law and order to govern the people’s natural desires, and to establish peace. This is objective moral law, and is, as Hildebrand says, “independent of all subjective interests, arbitrariness, and mere power.”(2) This moral law, then, requires people to treat others with dignity and care for their needs. On a very basic level, a person is required to be given food, shelter, and water, the basics for survival. This much we owe the Syrian refugees. Nobody expects the refugees to be given a million dollar house and cars and jobs, etc. What we can give them is a safe place to stay that is equipped with the comforts we can afford them. Thus, if a society is capable of giving aid to a people in need, then they have a moral obligation to do so. 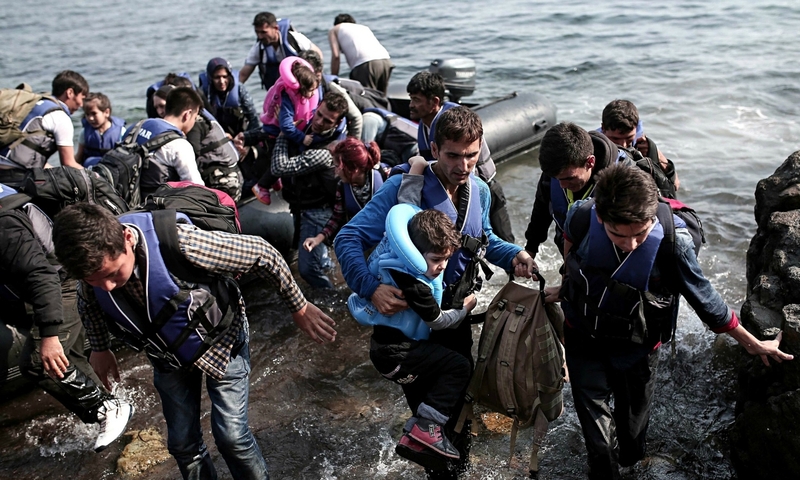 Is it right for some U.S. governors to turn away Syrian refugees? Although their reasons are understandable, they are ignoring a natural moral call to help other human beings in need when they simply refuse to offer support. People everywhere bring with them their human nature, with all of the good and all of the bad things that come from it. It is foolish to assume that blocking a few refugees from entering will solve the threats to security. It is also foolish to assume that inviting the refugees in will not result in any sort of conflict. Yet, as St. Augustine said: “Nowhere in life are we secure, except in God’s promise - only when we have attained to it, when the gates of Jerusalem are shut behind us, shall we be perfectly safe.” (3) Perhaps it is better to help a few families in need at the risk of letting in bad people, rather than denying all people aid. So should countries all over open their borders to receive these refugees? Who can answer that? The threat to security is a very real and near threat. However, it is perhaps wise to consider that that problem cannot necessarily be solved by blocking refugees from entering a country of safety. While we may stop a few terrorists from entering through the open and regular channels, we will stop many needy and broken families, torn apart by the violence that they have witnessed, from receiving the necessary aid we are obliged to give them as fellow human beings in need. Hildebrand, My Battle Against Hitler, 278. Hildebrand, My Battle Against Hitler, 295. St. Augustine, Expositions on the Psalms, 100.8.